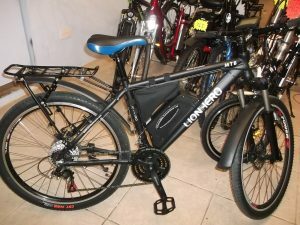 This all purpose road bike comes with tube mounted battery, Integrated lights, kickstand, Rear rack and full mudguards. 21 speed shimano gears allows the rider to cruise up hills with minimum effort. The state of the art electronics comes with Speedo, odo, trip computer, Walk function and cruise control. USB port for charging Phones Etc.